I’ll be with you in a minute, Mr. Peabody! If you ever get a chance to see Bringing Up Baby with the DVD commentary by Peter Bogdanovich, do! I watched the movie today, and when it was over I started it again with the commentary, figuring I’d just listen to a few minutes of it. I ended up watching the whole movie all over again! The commentary reeled me in, which is pretty rare. Lots of DVD commentaries are dull, dull, dull, but this one wasn’t. Bogdanovich peppers the commentary with readings of excerpts from interviews he did with Bringing Up Baby director Howard Hawks in the 1960s and ‘70s, and when he does that he plays both parts, impersonating Hawks. Pretty funny, like he’s performing a little play. He throws in a Cary Grant impersonation now and then, too. The best part about the commentary is just how amused Bogdanovich is by the movie, even though he’s clearly seen it many, many, many times. (He used the framework for the film when he made his own screwball comedy, What’s Up Doc?, with Barbra Streisand and Ryan O’Neal in the early ‘70s. That’s another one on my t0-watch-soon list.) Bogdanovich can’t help laughing out loud over and over, and it made me laugh out loud with him. I bet I’ve seen Bringing Up Baby fifteen or more times, (something I should probably be embarrassed to admit, huh?) and I catch something new every time. The movie is so zany, fast, and full of hilarious bits of dialogue and physical comedy that you can’t take it all in in just one viewing, or even three or four. 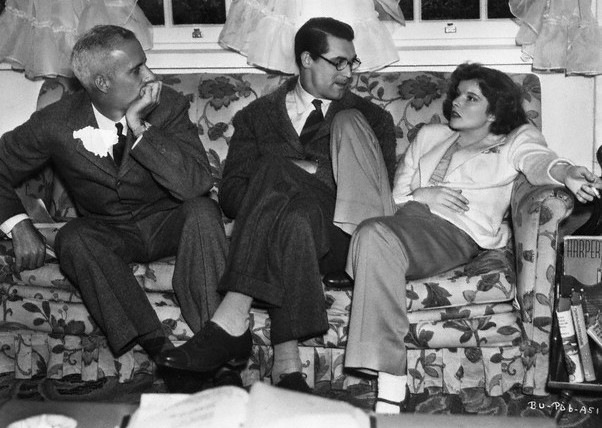 I don’t think Cary Grant was ever funnier than he was as Professor David Huxley, wearing his geeky Harold Lloyd glasses, “tsk, tsk”-ing and “oh dear”-ing all over the place, getting more and more frustrated by the frantic lunacy Katharine Hepburn’s nutty but endearing Susan Vance drags him into. It’s worth it to spend at least one viewing of the movie keeping your eyes on Cary the whole time. Every little look, noise, line reading, and bit of business he does is brilliant. He plays it all straight, that’s what makes it so funny. Susan’s just plain driving him insane! And yet she’s making him much more human at the same time, breaking him out of his stuffy, academic rut and rescuing him from the boring, cold fish fiancee who doesn’t even want to go on a honeymoon with the dishy doctor. The character actors in classic movies are some of the best things about them. There are so many wonderful faces and kooky characters. I appreciate seeing my favorites pop up over and over — it’s like running into an old, beloved friend. There’s something comforting about seeing people like Edward Everett Horton, Beulah Bondi, Charles Coburn, Spring Byington or Edward Arnold appear on the screen. You know them, you love them, and you’re sure you’re going to have a great time with them. Charles Ruggles is so good in Bringing Up Baby, playing Major Applegate, a big-game hunter and friend of Susan’s Aunt Elizabeth (the also wonderful May Robson). Everybody in this dinner scene is perfection, actually – even the famous dog, Asta, who plays George. It’s just so wacky! The Major doing leopard cries, David repeatedly getting up from the table to follow George outside, hoping to finding the intercostal clavicle, Aunt Elizabeth appalled by David’s behavior and Susan totally smitten by her dear “Mr. Bone”. “It was probably an echo.” “Yes, well it was a long time coming back, wasn’t it?” HA! I don’t think I could ever tire of this movie. I find it endlessly amusing and endlessly quotable. It cracks me up every single time I see it.